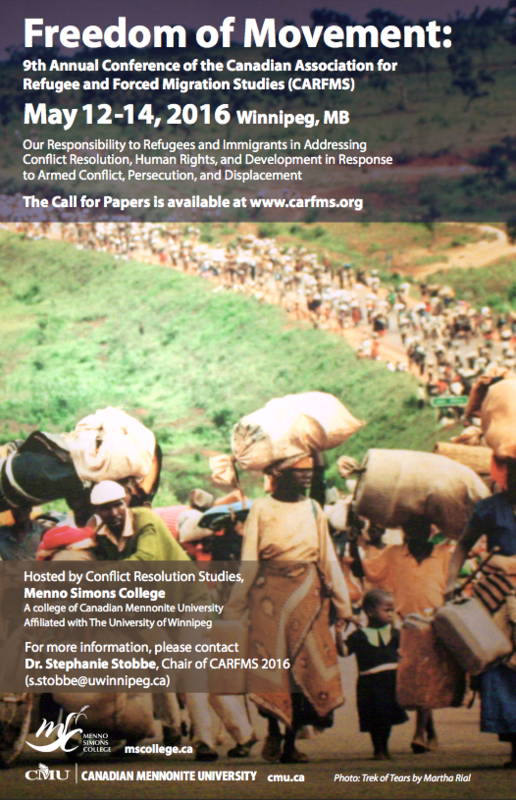 Peace Research: The Canadian Journal of Peace and Conflict Studies invites presenters at the Canadian Association for Refugee and Forced Migration Studies (CARFMS) 2016 Conference held in Winnipeg, Manitoba to submit conference papers focused specifically on conflict resolution and international development. The 2016 conference “Freedom of Movement: Exploring a Path from Armed Conflict, Persecution, and Forced Migration to Conflict Resolution, Human Rights, and Development” was chaired and hosted by Dr. Stephanie Stobbe and the Conflict Resolution Studies Department of Menno Simons College (MSC), a College of the Canadian Mennonite University at the University of Winnipeg. MSC is also the home of Canada’s premiere journal of peace research, Peace Research: The Canadian Journal of Peace and Conflict Studies. In a spirit of collaboration and recognition of the centrality of refugees to peace and conflict studies, MSC will be devoting the 2017 volume of Peace Research to CARFMS papers. Please submit an electronic copy of the manuscript by email to peaceresearch@uwinnipeg.ca. The electronic copy can be submitted as either a Word DOC file or an RTF file from any other word processing program. The preferred length is 20-30 pages or 6,000–9,000 words double spaced. Chicago Style is the journal’s citation format. Priority will be given to submissions from PhDs and PhD students.